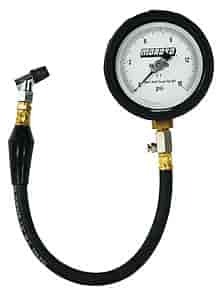 Designed to check tire pressures around the garage, where the accuracy of a track air pressure gauge isn't necessary. 2-1/4" Face. Long 16'' hose with with finger operated air-bleed valve and hardened steel swivel chuck that rotates 360 Deg. for positive valve stem attachment. Includes a rubber gauge cover. Premium high-quality instruments with brass internals and Bourdon Tube Pressure Element provide full-range accuracy to within 1/2%. Large 4'' face. Adjustable pointer can be calibrated at the track. Long 16'' hose with pressure release valve and hardened steel swivel chuck. Includes rugged polyethylene carrying case is lined with a medium-density foam to protect the gauge. Used by more racers than all other brands combined. Calibrated for accuracy within 2%. Large 2-5/8'' face dial. Hardened chuck rotates 360° for positive valve stem attachment. 16'' hose with a finger operated air-bleed valve allows you to release pressure quickly.